ULTRASCOPE and DIFRASCOPE technologies provide a configurable gain up to 80 dB, which is usually enough for most common applications. However, for some techniques like TOFD higher gains are required, and cables up to 10 meter length are used. 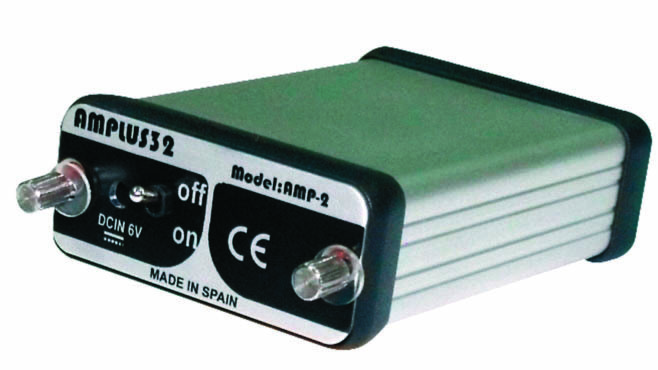 In those scenarios, AMPLUS-32 improves signal to noise ratio adding up to 32 dB of extra gain when located very close to the transducer. Its low size and weight and its internal battery makes AMPLUS-32 the best option to mount on-board the inspection head. Furthermore, it is a valuable tool for laboratory tests with ultrasound transducers and hydrophones.